Few things are as exciting in sports as when your team makes its entrance just before kickoff. Landmark Creations was called on to help pump up the fans and rain down team spirit on the stadium. According to UCONN’s K-9 mascot Jonathan (and translated by Kevin Solomon), the crowd will know the Huskies have come to play when the team hits the field using their new inflatable. There’s hardly a player alive that wouldn’t agree – screaming fans keep morale high and the team excited. And that’s what football is all about. 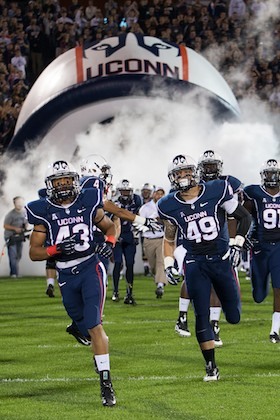 Looking for an inflatable tunnel for your collegiate, high school or youth football team? Browse our online gallery!